What are you reading this week? What’s that? Shut up, put it down. Now, run out – I DON’T CARE IF YOU’RE IN YOUR UNDERWEAR! 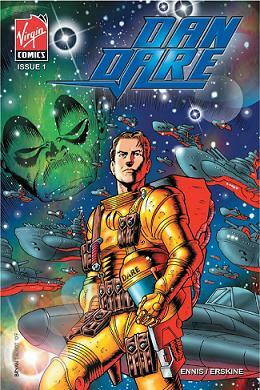 – and pick up Dan Dare #1. Seriously, this is Garth Ennis at his best. This is sci-fi comics at its best. This is oh-my-god-where-is-the-next-issue-I’m-going-to-shoot-someone- at its best. Take a classic British comics icon and update it for today and you’ve got yourself some good readin’. Ennis, and artist Gary Erskine (oh yeah! ), create a suspenseful, exciting look into a future/present where nuclear war has gone unchecked and scary aliens run amok. It’s a seven issue mini from Virgin Comics and it looks to be a great one. Don’t miss out! This entry was posted on Saturday, December 1st, 2007 at 10:38 pm and is filed under Commentary, Review. You can follow any responses to this entry through the RSS 2.0 feed. You can leave a response, or trackback from your own site.